Webasto Donghee Co. (a 50:50 joint venture between Germany's Webasto AG and South Korea's Donghee Industrial Co.) supplies the new Kia Venga's optional two-piece tilt-and-slide panoramic sunroof, which covers almost the entire roof. Italian partsmaker Magneti Marelli S.p.A supplies the minivan's halogen headlamps from its Czech Republic facility and rear lamps from its plant in Poland. The Venga's stop-start system as a started from Japan's Deno Corp. while U.S.-based Delphi Automotive LLP and Robert Bosch GmbH of Germany contribute other important components to the fuel-saving technology. The Venga's stop-start system automatically switches off the engine when standing still and immediately restarts the engine when its time to get going again. This makes substantial fuel savings - particularly in city driving - reducing the Venga's CO2 emissions to 117 grams per kilometer. By comparison, the same powertrain without start-stop and other Kia tweaks to improve fuel use emits 124g/km of CO2. 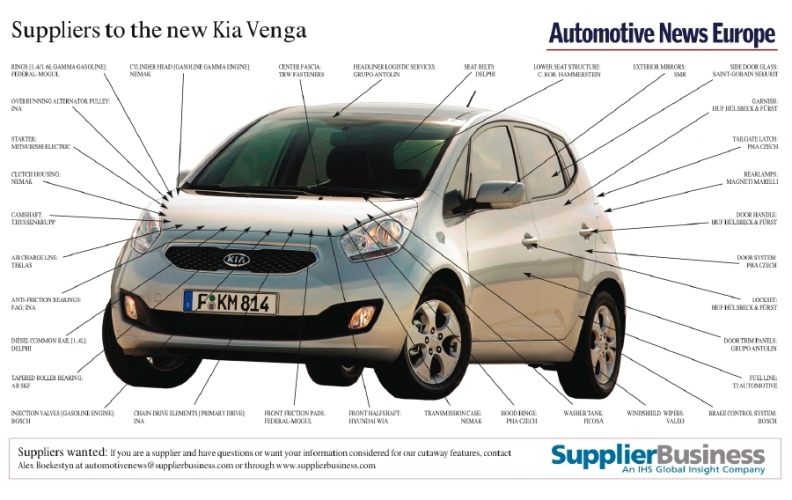 With CO2 below 120g/km the Venga qualifies for tax breaks and other benefits given to low-CO2 cars in many European countries. Designed and engineered by Kia in Germany, the 4068mm-long Venga features an unusually long wheelbase for its class -- 2615mm -- and offers a 1600mm high roofline to maximize cabin space.